Motorola’s high-end model in the Moto G6 lineup, the Moto G6 Plus has now paid a visit to the Geekbench benchmarking site, revealing key specifications of its own. The Moto G6 Plus running Android 8.0 Oreo is now said to be powered by the Qualcomm Snapdragon 660 chipset, coupled with 4GB of RAM. Earlier rumours stated that the device would arrive with Snapdragon 630 SoC and the same SoC could be the final one because the scores achieved by the G6 Plus in today’s listing are in-line with the scores achieved by other Snapdragon 630 SoC. The Moto G6 Plus achieved 866 single-core score and 4123 multi-core score, which are underwhelming for a Snapdragon 660 SoC smartphone. 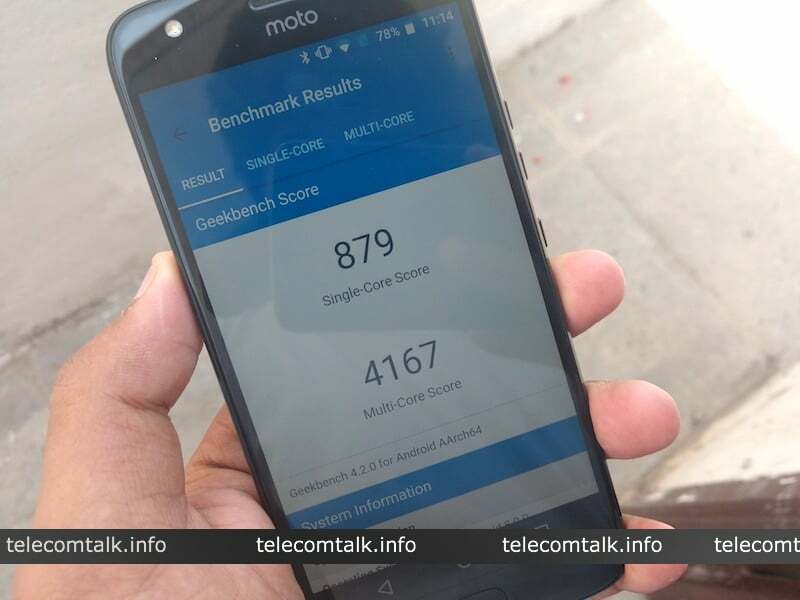 These scores are equal to the ones which the Moto X4 achieved. So, it’ safe to assume that the Snapdragon 630 chipset will be powering the Moto G6 Plus. The Snapdragon 630 SoC and Snapdragon 660 SoC were launched at the same time and feature the same higher clock speed of 2.21GHz. However, when it comes to specifications, the SD 660 chipset is miles ahead of the SD 630 SoC because it features custom Kryo CPU cores. Motorola will be launching the G6 lineup of smartphones on April 19 in Brazil as the press invitations for the same are already out. The Moto G6 lineup will consist of three smartphones with the G6 Plus leading the chart. Complete specifications of the Moto G6 Plus were leaked earlier as well. The device will rock a 5.93-inch Full HD+ display with 18:9 aspect ratio and no notch. Below the display, there will be a fingerprint scanner, so Motorola is following the footsteps of Huawei. The G6 Plus is said to arrive in a 6GB of RAM model, which would be a great thing for Motorola fans out there. It will, of course, pack dual rear camera setup, along with a single selfie shooter but with an LED flash. The phone is rumoured to have a battery of 3000mAh battery, and sadly, it will run Android 8.0 Oreo out of the box. Alongside the Moto G6 Plus, the Lenovo-owned company will also launch the Moto G6 with Snapdragon 450 SoC and the Moto G6 Play with Snapdragon 427 SoC. The Moto G6 and G6 Plus might be launched in the Indian market right after the Brazilian launch. One of the most ittiest company ever in last two years!!!!! I will buy Motorola Motorola Z play over this line up any day any time!!!!! I will even buy Motorola Moto Z2 over this any day!!!!! Most probably, it won’t be SD660..